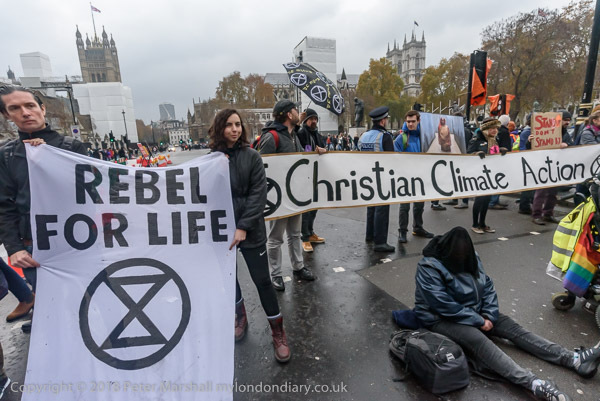 It was a big day for XR (Extinction Rebellion) which began with several groups blocking the roads around Parliament Square where a rally was taking place in the newly turfed centre. The XR ‘Declaration of Rebellion’ was again read by all, pointing out the failure of government and of “corrupted, inept institutions” to take action, thus threatening our future, and declaring it to be “our duty to act on behalf of the security and well-being of our children, our communities and the future of the planet itself“, and then there were speakers, singers, a flute player and more before it was time for XR to carry out a burial, with a black coffin, topped by lilies being carried by pall bearers into the centre of the square. The protesters formed a tightly-packed ring around the centre of the square and the grave-diggers brought in their spades and began work. 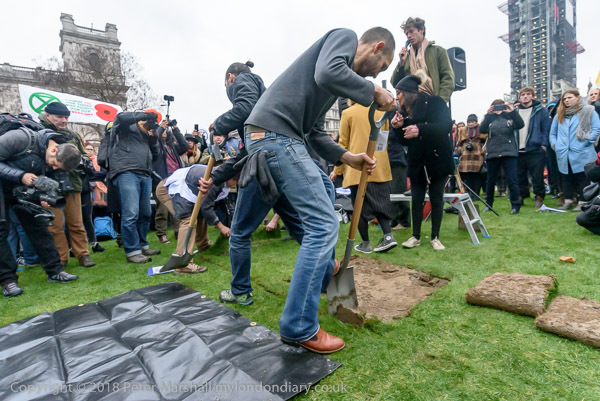 Unfortunately when they began digging, caerfully lifting the turf and putting it to one side, they found the turfing had been done on the cheap, and the ground beneath, compacted by years of feet and occasional heavier use, was like concrete, making digging almost impossible. 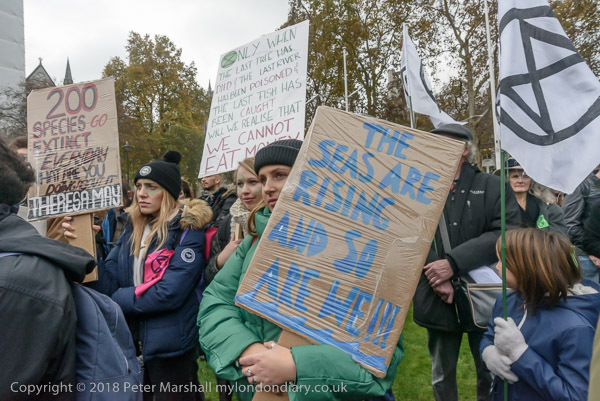 No wonder too that the grass which had grown there previously had never shown much resilience, turning to mud after almost any slight footfall – as it will have had no roots below the top inch or so. 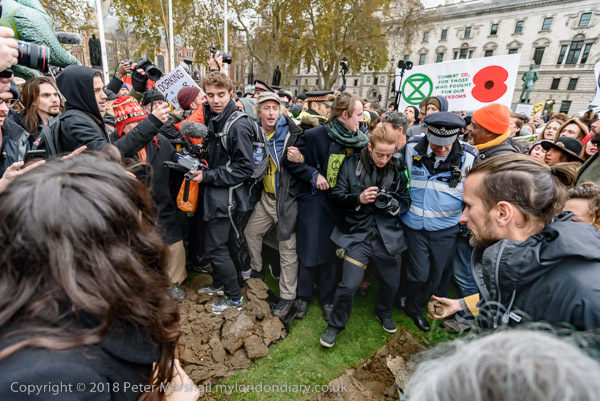 But the protesters care – and their intended digging out of a grave, which after refilling would almost certainly have been beneficial for the lawn – was for naught, as police forced their way through the crowd, trampling the carefully laid aside turves to pieces and further compacting the bared soil. It’s arguable whether or not the protesters were guilty of ‘criminal damage’, but the police certainly were. Things got rather intense, with a great deal of forceful pushing and shoving by police and we were all packed together. Using the 16mm fisheye and the 18mm end of the 18-35mm lens enabled me to continue taking photographs, though at times it was difficult to lift a camera. The XR organisers tried to keep the protest going and calling for calm and for people not to be provoked by the police action. 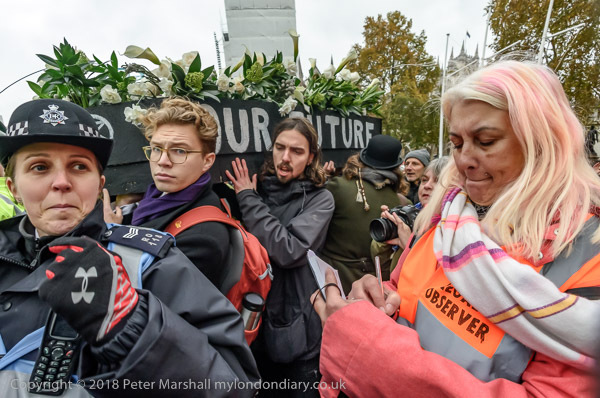 I was right at the centre when I saw the coffin surrounded by police near the edge of the crowd, and it was had to get out of the crush, even though everyone was happy to let me through. I managed to rush around the outside of the crowd and then make my way in again towards the coffin. Police had surrounded and stopped the coffin being carried further onto the square, where they also apparenlty stopped a second attempt to dig a grave, though the crowd in the middle of the square was too dense for me to see or photograph this. For some minutes, everything came to a tightly-packed standstill until eventually XR decided the time had come for the next stage of their action. This entry was posted on Wednesday, January 23rd, 2019 at 12:07 pm and is filed under My Own Work, Political Issues. You can follow any responses to this entry through the RSS 2.0 feed. You can leave a response, or trackback from your own site.